Assembled the back for Purple Passion yesterday. 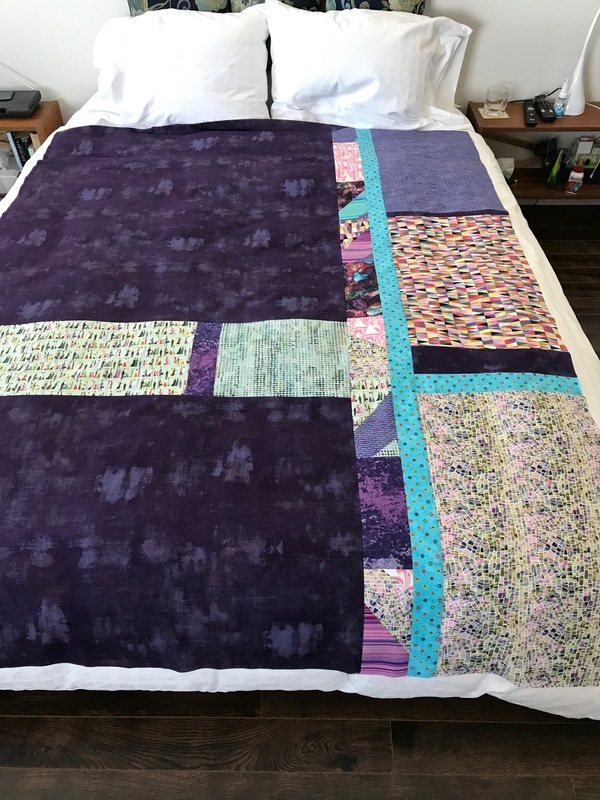 The point was to use up leftovers and retain enough of the purple grunge fabric to be able to bind the quilt without having to buy more fabric! 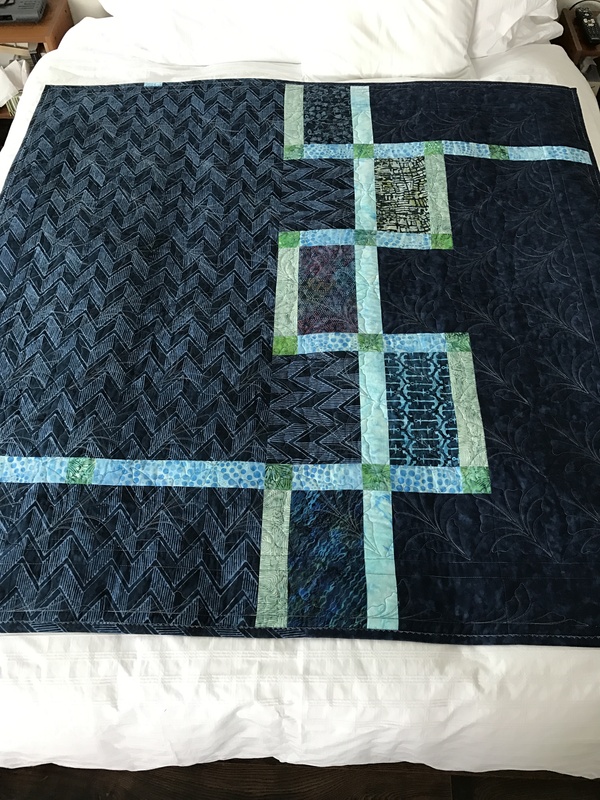 I used leftover blocks from the quilt top, cut in half to assemble the narrow pieced strip, then used large blocks of the leftover fabrics to create a wide strip. 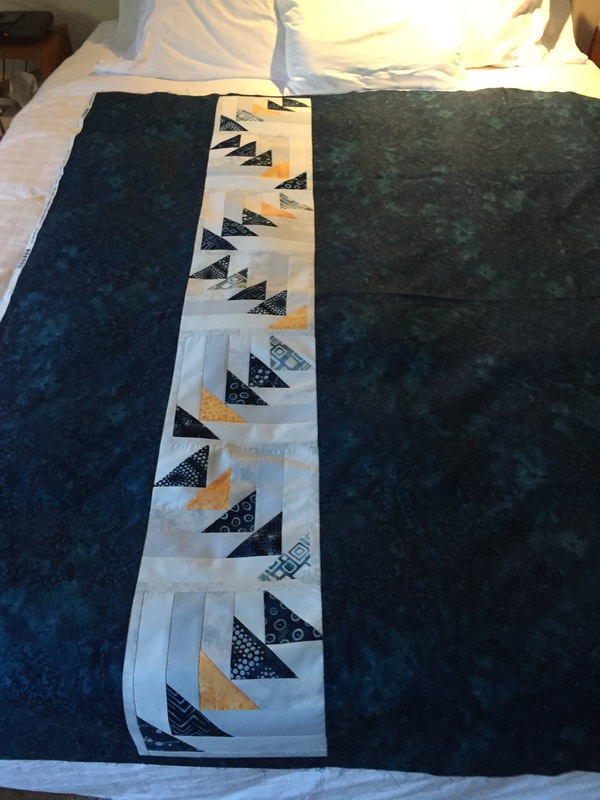 I decided this time not to insert the strip but to use it as a panel on one side, instead. 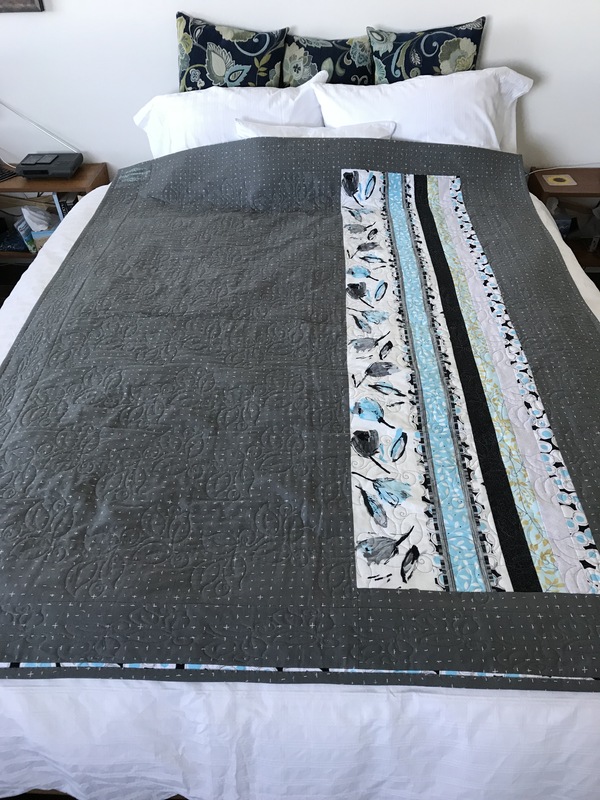 Then I set up the quilt sandwich – I’ve described how I do this somewhere in the blog but can’t find the specific post. 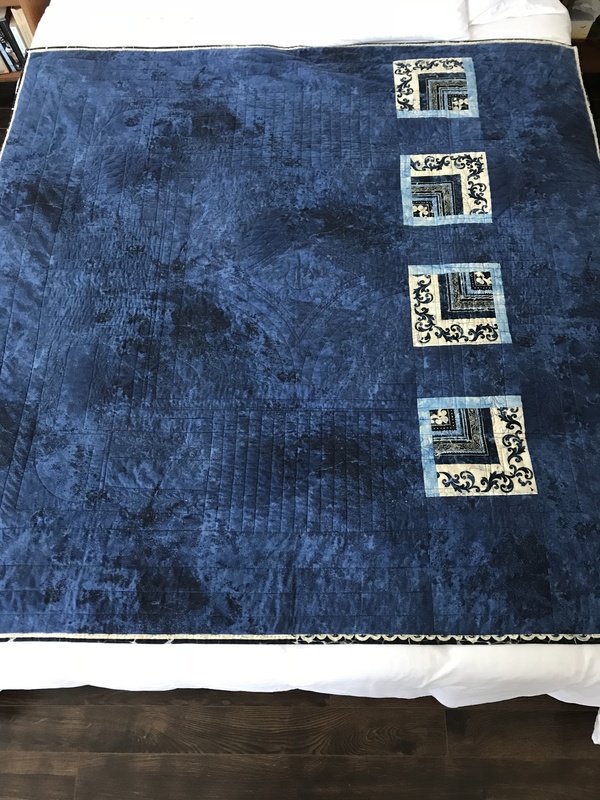 When I started quilting, I would tape the quilt back to the floor, lay the batting on top, then position the quilt top, smooth out the whole thing and pin. 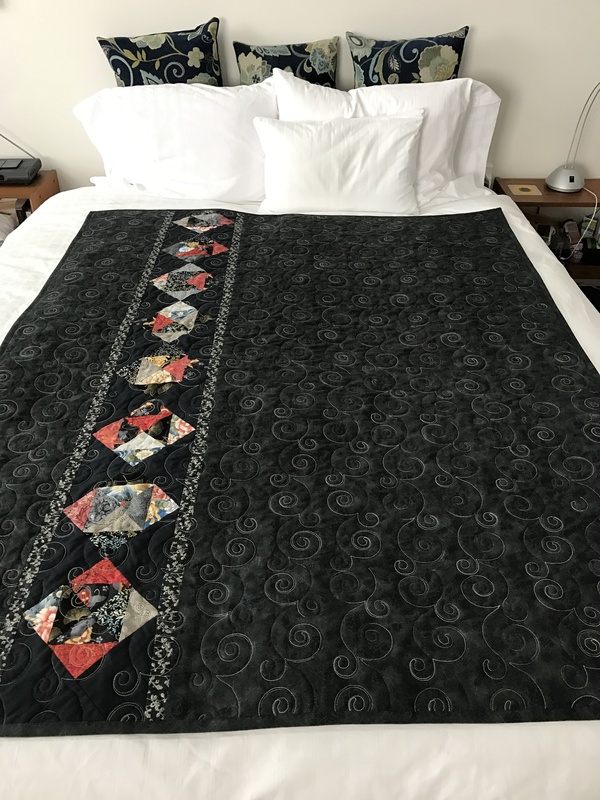 But getting up and down has become difficult – it’s an age thing – and one day I tried rolling each layer on a pool noodle, and working on my dining room table. 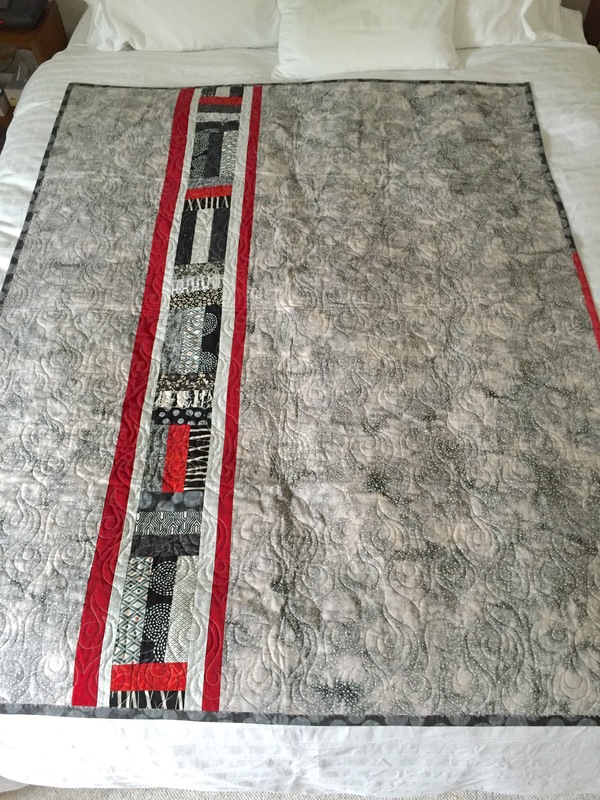 That made assembling the quilt sandwich quite a bit easier. One day it dawned on me that 1 x 4 boards would provide some weight and allow me to apply a bit of tension to each layer as I progressively pinned the sandwich. That’s what you see here. 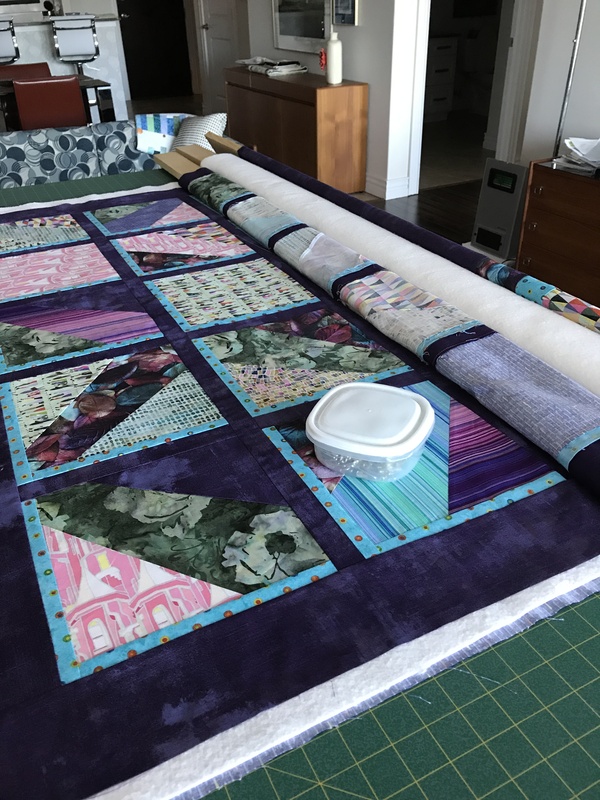 Each layer is rolled on a board, the layers placed on top of one another. 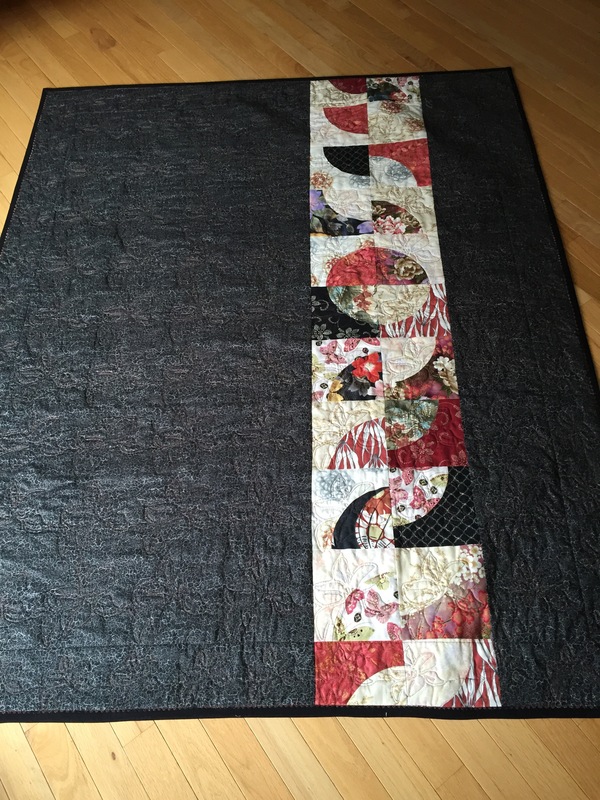 I will pin the exposed layers, roll that part up and continue pinning until I’ve reached the other end, taking care to keep the quilt back as smooth as possible. 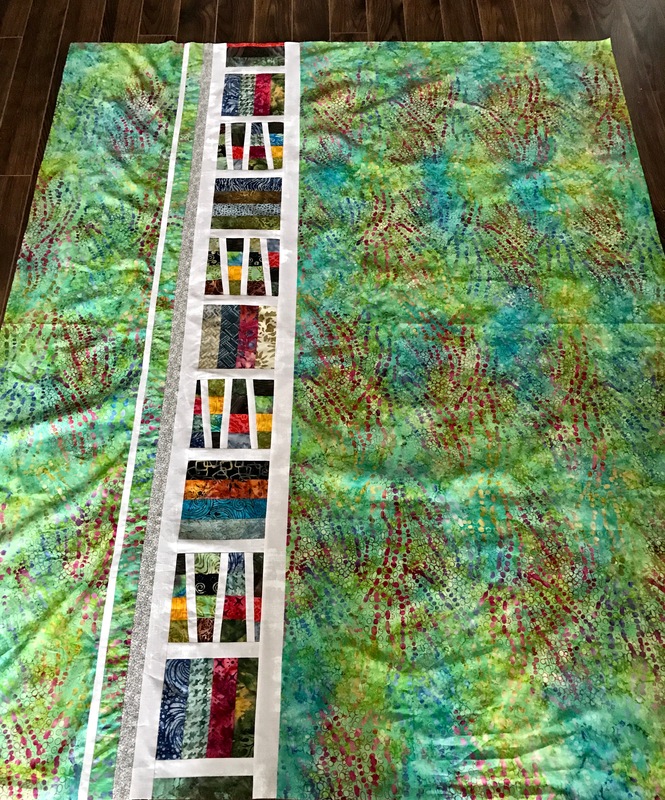 I’m working on my cutting table which is a good height for this step – I don’t have to bend over as I did on my dining room table – much easier on my back. I’m now ready to begin pinning. 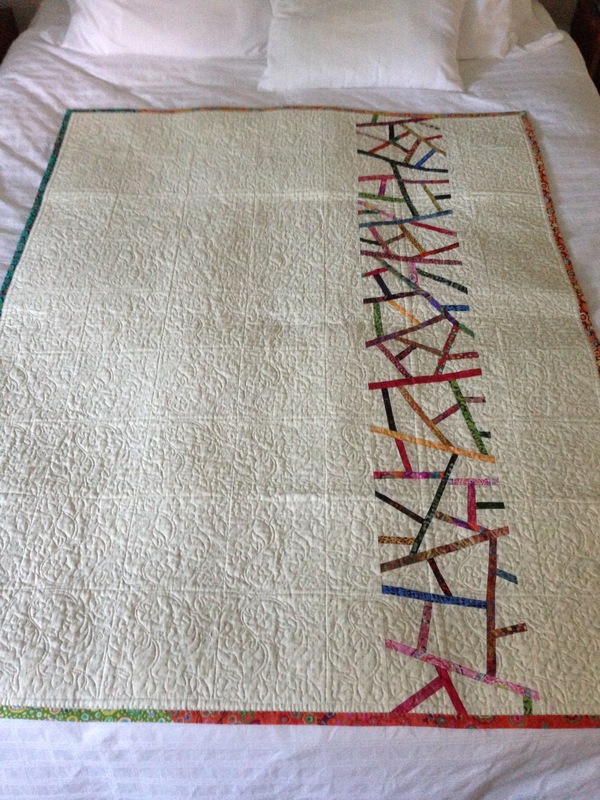 Once that’s done, I will stitch-in-the-ditch to stabilize the sashing and outline the narrow drop shadow border. 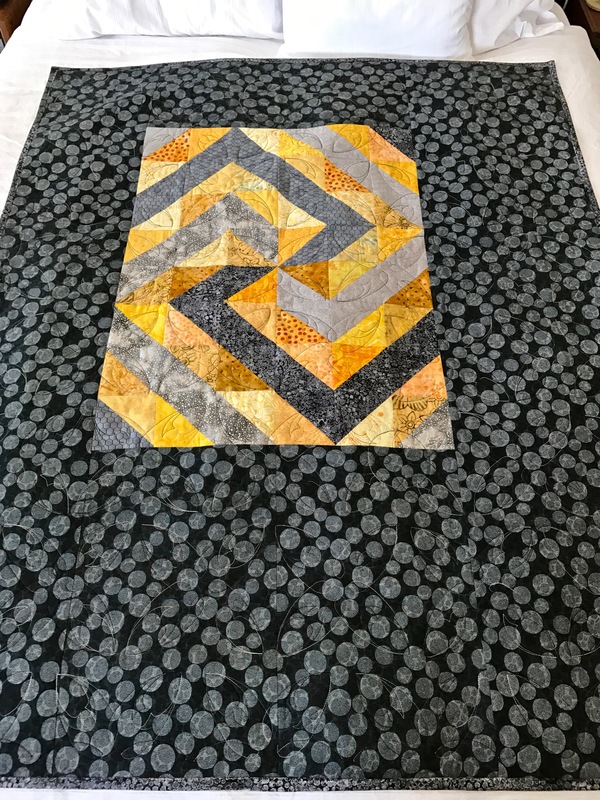 Then I’ll quilt each block once I’ve created an embroidery for this quilt.